Mumbaikars may die younger than other Indians, according to the Human Development Report 2009 by the National Resource Centre for Urban Poverty and the All India Institute of Local Self Government, Mumbai (published in the first week of November), but the Capital is none too healthy a place to live in either. Delhi residents dependent for their water needs on a dying river are getting sicker and sicker by the day, finds a soon-to-be-released report. 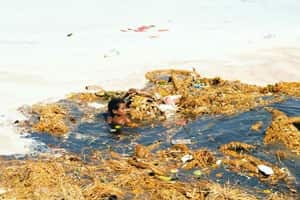 The Delhi-based PEACE Institute Charitable Trust, which initiated the study to discover the correlation between the health of the Yamuna and the health of the community dependent on it over the last 25 years, unequivocally blames the Capital’s increasing ill-health on the river’s condition. It has based its findings on data collected largely from different state agencies. The study, supported by Ford Foundation, says Delhi’s per capita spending on healthcare is more than three times the national per capita: a figure that shows how high its disease burden is. The figures are telling: From just 9,750 cases of typhoid in 2000 in Delhi, the figure rose to 20,864 in 2008. There were 2,850 cases of Hepatitis A virus in 2006, going up to 5,425 in 2008. As for diarrhoea, from 0.13 million in 2002, the figures zoomed to 0.24 million in 2007. In its 2008 shortlist of 13 killer communicable diseases (those that caused 100 or more deaths that year), India’s Central Bureau of Health Intelligence puts acute diarrhoeal disease and typhoid at fourth and eighth positions, respectively. And this is probably the tip of the iceberg. The report suggests the figures are likely to be far higher since “complete data from private health practitioners and institutions does not reach the government recording system". Indeed, estimates suggest that 71% of Delhi is dependent on private practitioners for health needs. While there is a direct link between contaminated water and waterborne diseases, the Yamuna also probably has a hand to play in the rising cases of cancer in the city. The report points to the high level of contamination in vegetables irrigated by the water of the river. Not only do common vegetables (such as spinach, radish, brinjal, cauliflower, tomato and cabbage) contain all kinds of pathogens, including Salmonella typhi and typhoid bacteria, they also carry high traces of heavy metals and pesticides, harmful to human health. Most Delhiites spend a lot on filtering and boiling water, but ignore the perils of eating vegetables, which have been grown locally, raw. Contrary to conventional dietary wisdom, it’s best if Delhiites do not eat raw vegetables or salads. All vegetables should be either steamed or boiled. While poorer households are more prone to morbidity from waterborne diseases, the study finds that the exposure to contaminated water is high across all economic groups. Most higher income households (houses built on private plots, commercial plots, multi-storey buildings, cooperative group housing societies) do not depend solely on the Delhi Jal Board as they have groundwater abstraction facilities. But with the groundwater table sinking to new lows, there is increased chemical concentration in that water too. “Much of the groundwater in Delhi, besides disappearing fast, is unhealthy, with virtually all kind of contaminants—nitrate, arsenic, fluoride and coliforms. There are areas with cadmium, mercury and other heavy metal contamination also," notes the study. Alarmingly, these are above permissible levels, posing serious health hazards. Quite clearly, Delhiites need to do more to save the river.